First, let’s discuss why this quadcopter represents an innovative way of thinking compared to present machines like the DJI Phantom, Blade 350 and other similar drones. Up until the BeBop, the only way to gain many of the desired features was to add size and weight. As an example, the basic DJI Phantom 1 weighs about 800 grams with battery and no camera. The fancier model which can take stabilized video weighs about 1250 grams. As the weight increases, so does the battery size, motor size and that of most of the components. 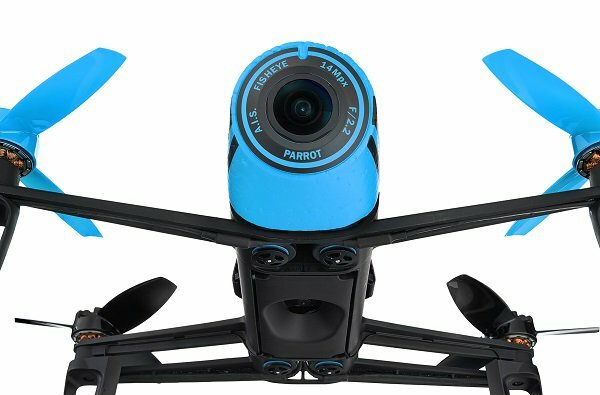 Instead of continuing in this manner, Parrot started with a blank slate and created a quadcopter which was as light as possible – yet still has most of the features that current buyers desire (stable video, GPS, FPV, etc.). All of this was packed into a small quadcopter which weighs about 400 grams – 1/3 that of a Phantom 2 Vision+ and less than 1/2 the weight of the new Blade 350QX3 AP (aerial photography) model. This lightweight design has advantages – and disadvantages over heavier drones. Advanced materials combined with from-the-ground-up design helped them create what is now the lightest drone with stabilized video. But the real secret sauce is in the camera stabilizer. Instead of using a heavy camera gimbal, they used a combo of software and hardware which produces stable video…even when the quadcopter is shaking and dancing around in the wind. We are impressed by the claimed specifications – however, we have had problems with Parrot‘s earlier models. They were often buggy and didn’t live up to the marketing hype or expectations. For example, the new Rolling Spider was so buggy that we couldn’t even finish a review and had to return it to the vendor! We also had problems with the earlier models of the AR Drone, although most problems were solved in later (and current) models. The proof will be in the pudding..as they say…and we have already purchased a BeBop for extensive testing. Unlike other technology and review sites, we don’t reprint manufacturers claims or just take a quadcopter for a flight or two and then post a glowing review. Instead, we buy and try it just like you, a consumer, would. In general we don’t even suggest being the pioneer of any new quadcopter model…unless you want to be! It often takes some time for both the hardware and software to be tuned. If you are the more cautious type, wait until this coming Spring and in the meantime read the longer term reviews and ratings that the new owners post online. Note – these are opinion and subject to change! Assuming it works as promised, this may very well be a quadcopter for the masses. Still, it should not be compared with aircraft such as the DJI Phantom 2 Vision+. The video quality, camera control and proven capabilities put the Phantom at least a notch or two above the Bebop. For example, institutional and low-end commercial (real estate, construction, inspection, etc.) videos can be made with the Phantom – less so with the BeBop. It is more of a “consumer drone”, while the Phantom is on the line between “consumer” and “prosumer”. Ipad or iphone control is standard – and this method has proven less than perfect in previous drones. It’s difficult to achieve the “feel” of precise control and the software can have bugs and glitches. Range can be limited as compared to drones with separate R/C Transmitter controls (w/joysticks). Parrot is offering an upgrade called the SkyController which extends the range and also had joystick control – however, this brings the price up to $900 which is closer to what some higher-end models are selling for. Our initial advice would be to consider this model only if you are looking at the basic $500 unit. All in all, we are glad to see Parrot shaking things up at the lower-middle end of the quadcopter market…and some of the demo’s are exciting. One particular project involves pairing the BeBop with the Occulus Riff headset for true “in the pilot’s seat” flying. In a year or two, this type of application may be a reality. Stay tuned for actual buying and flying experiences! Note – as of now, the BeBop is available at BestBuy and the Apple Store – not at Amazon yet, but it is expected there relatively soon. Here are some sample videos from actual users – not bad! Reviews coming in show very mixed results and some less than perfect customer service experiences when Parrot is contacted. We’ll keep our eye on the BeBop and report back when and if it meets it’s promise. For now – here is our list of some of the best models in all price ranges for this Holiday Season and the New Year. Amazon is taking pre-orders on the BeBop complete with the much longer range..and more precise…skycontroller.